Just finished reading Cherries in Winter by Suzan Colon. My sweet friend Heather brought it to my house Tuesday night, and I haven’t been able to put it down. It’s the perfect book to read when the sun is hidden and snow flurries are in the forecast. I was not, and am not, the best housekeeper in the neighborhood. The competition of getting the first line of wash out on Monday morning has never interested me. Putting the dishes in the sink “until later” was, and still is, my practice. There are so many more important things than dishes. Sometimes the house is such a mess that I think, “On Saturday I must do this–or that–or whatever is most in need of doing.” But when Saturday comes along, and it is a delightful, delicious day, and my husband says, “Let’s the three of us go fishing,” we all look at each other–guiltily–and of course they stick me with the decision. 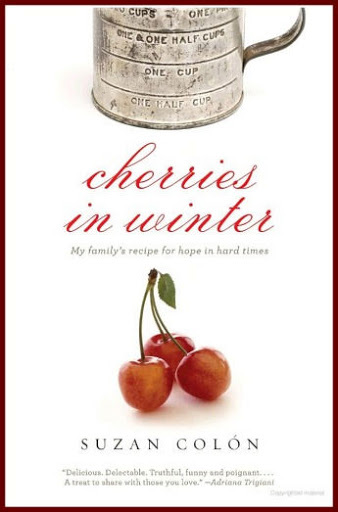 Cherries in Winter is an uplifting read. I recommend you bake some scones (see recipe below), put the tea kettle on and cuddle up on the couch with your honey. That’s what I plan to do tonight. These scones are moist and delicious, not hard and crunchy like the ones at Starbucks. The recipe comes from Prudent Baby. And I should mention that I didn’t have cream, so I substituted ricotta cheese and a tad bit of buttermilk instead. In my stand mixer, I combined the first four ingredients. Add butter (chopped) and mix to a meal. Add cream OR ricotta cheese and buttermilk and mix. Add berries and mix. Place onto flat surface and cut into triangles or use cookie cutters to do circles or hearts. Sprinkle with more sugar and place on a cookie sheet (I put parchment paper below). Bake in 425 degree oven for 15-17 minutes. *I just realized I forgot to sprinkle with sugar when I made these. I guess I need to make them again to experiment, right? Sounds like a good excuse to me! Thank you so much for reading my book, and for giving it such a lovely review! I'm so glad you liked "Cherries." The part you quoted was one of my favorite pieces of Nana's advice…Can't wait to make the scones this weekend!Thanks again and all the best,Suzan ColonAuthor of "Cherries in Winter"